We are the Storm and Thunder team. 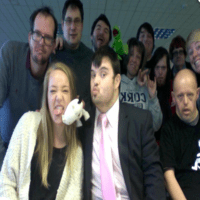 We are participants of the Gig Buddies project, that have a learning disability. There are about 10 of us who meet monthly to advise, guide and inform Stay Up late and the Gig Buddies project. It is really important for Stay Up Late to make sure that adults with learning disabilities are involved in every part of the charity. This is why the Storm and Thunder team was created when the Gig Buddies project started and remains a vital part of the project. We, the Storm and Thunder Team, believe that there should be “Nothing about us, without us!” and so does Stay Up Late. This means we do lots of things. For example, protests and awareness raising, writing easier to read safety guides, advising the team on policies, socials and the annual Christmas lunch! We are always looking for people with new ideas. If you think you would like to join the Storm and Thunder team then please ring the office on 01273 600438.